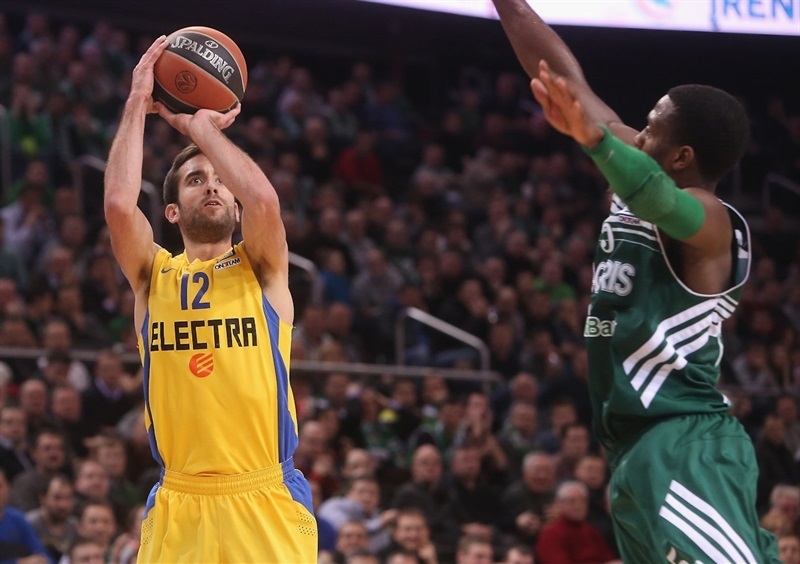 Maccabi Electra Tel Aviv used a big second half to beat Zalgiris Kaunas 78-87 on Thursday at Zalgiris Arena. 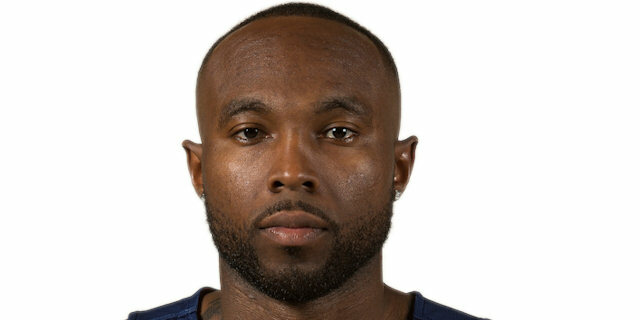 Tyrese Rice scored 12 of his season-high 20 points in the fourth quarter and Yogev Ohayon tied a Maccabi record with 11 assists to lead Coach David Blatt’s squad to its seventh straight Euroleague victory. 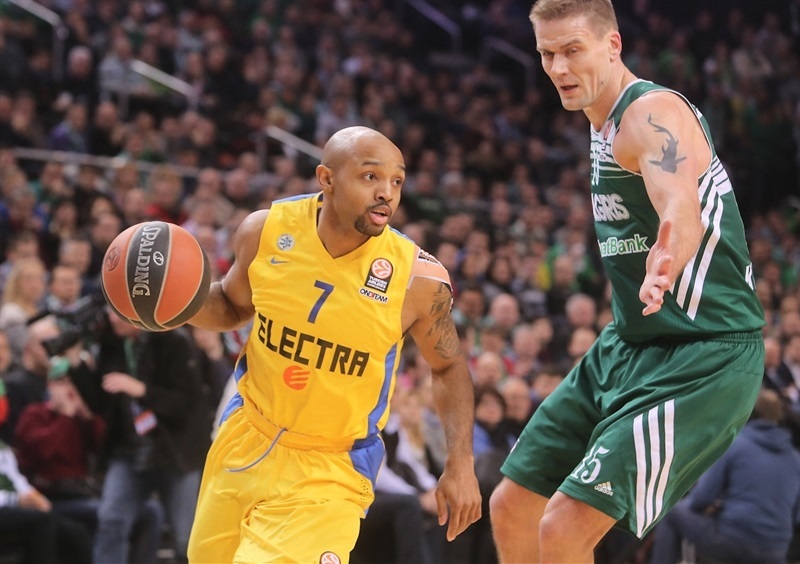 Maccabi is tied for first place in Top 16 Group F with a 3-0 record, while Zalgiris dropped to 0-3. The hosts led by as many as 9 in the third quarter, but Maccabi came back with a 2-14 run and the trio of Rice, Ohayon and Devin Smith combined for 22 of Maccabi’s 24 fourth quarter points as the visitors pulled away for the victory. Smith scored all of his 15 points in the second half and also grabbed 8 rebounds, while Shawn James, Alex Tyus and Ohayon each finished with 10 points. 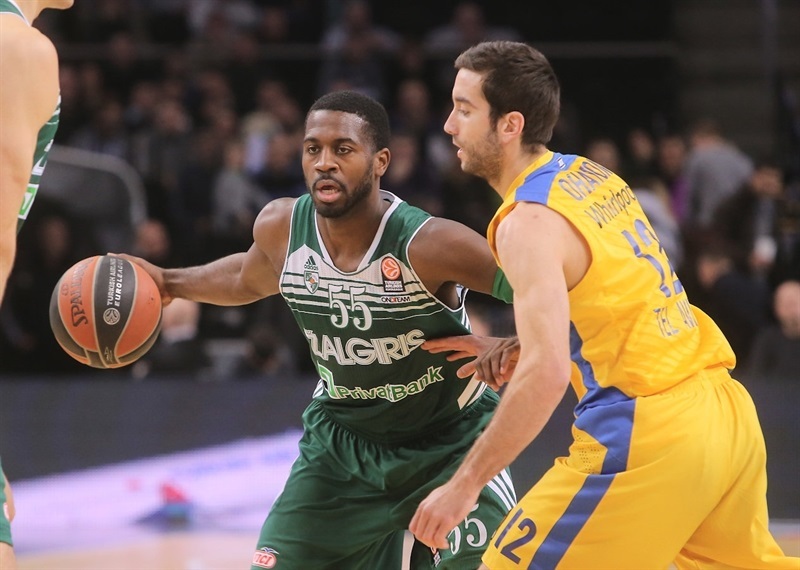 Justin Dentmon tallied 21 points and 10 assists to tie Zalgiris’s single-game record for assists. Paulius Jankunas scored 16 first half points and finished with 21, too, while Ksistof Lavrinovic added 10 in defeat. Zalgiris won the opening tip and went ahead on Jankunas’s three-pointer. James tipped in his own miss for Maccabi’s first points. The crowd got involved as Dentmon played the pick-and-roll with Robertas Javtokas resulting in a two-handed slam for the big man. Ohayon beat the Zalgiris defense with a downcourt pass to Joe Ingles for an uncontested layup. Javtokas remained a force for Zalgiris inside with a third basket and a 9-6 lead. The difference grew to 7 as Dentmon found Jankunas and Vytenis Lipkevicius on the break for dunks. Ricky Hickman looked to revive the visitors with a three from the elbow. However Tomas Dimsa made It 20-11 with a three for the home team. David Blu drained a three and Rice drove for a layup to bring Maccabi within 22-18. Lavrinovic scored on the offensive glass, but Guy Pnini drew a foul shooting a three with a second left in the quarter and made 1 to bring the scoreboard to 25-19 after 10 minutes. Tyus sank a pair of free throws to open the quarter. 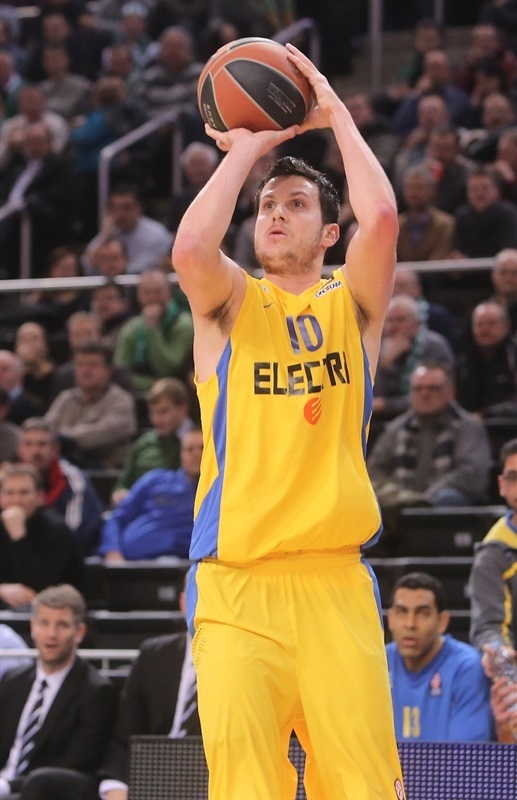 After missed chances at both ends, Blu sank a three to bring Maccabi within 1. Dentmon banked in a jumper and Jankunas buried a three to keep the Lithuanian champs in front, 30-24. Rice attacked the basket for a three-point play, but Lavrinovic soon responded with a three from the top of the key. James and Jankunas traded baskets in the paint before Rice struck a three for the visitors. Dentmon used his speed to get inside and keep the hosts in control. James scored twice to keep Maccabi within 3, however Dentmon proved unstoppable at the other end, including a wild three off one foot to make it 44-36. Blu and Jankunas traded baskets. Jankunas rejected Hickman at the rim to protect a 46-38 halftime lead. 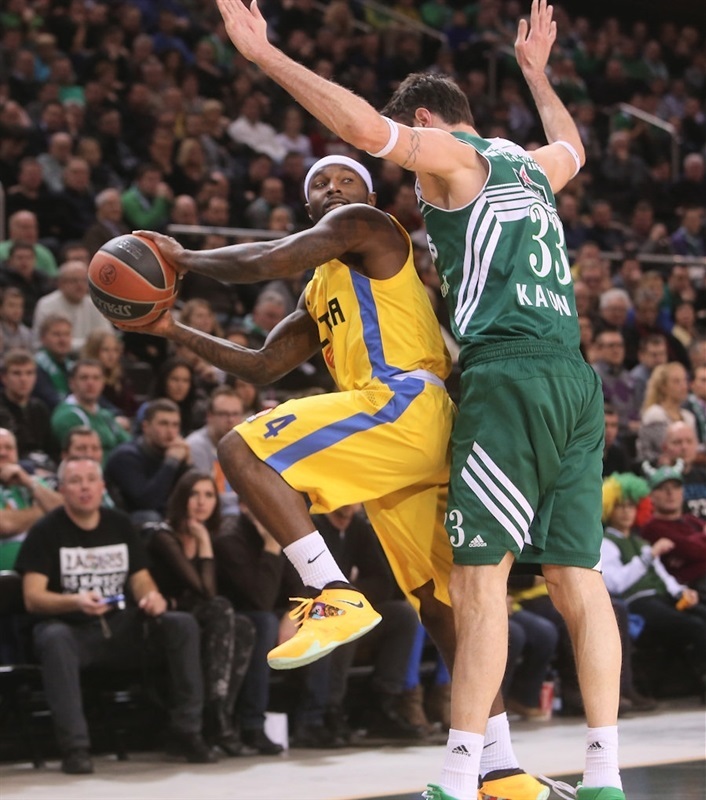 Smith went to the line for his first points of the game to open the second half for Maccabi. Javtokas rejected James and Dentmon scored again as the Zalgiris fans roared in approval. A third Jankunas three lifted the lead to 53-44. Ohayon set up Tyus inside, but Lipkevicius kept the hosts comfortable. 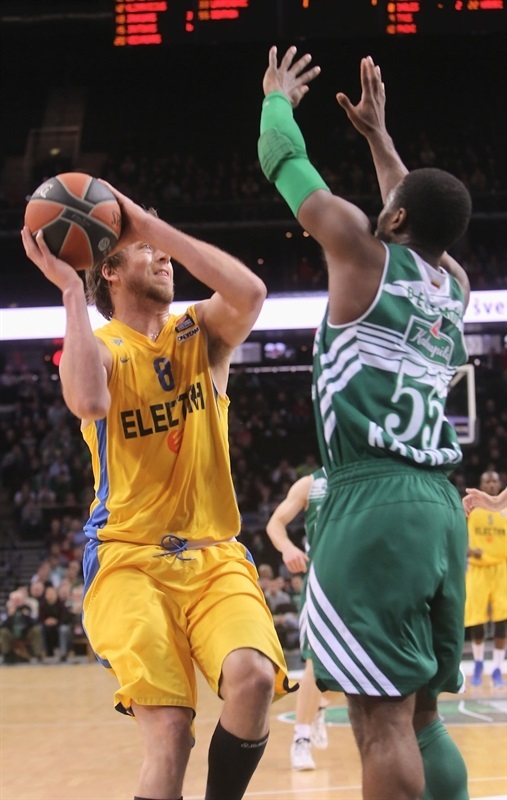 However back-to-back threes by Ohayon and Hickman – each player assisting the other – brought Maccabi within 55-52. Smith soon brought the visitors within 1 with a three-pointer before Tyus lifted Maccabi to 57-58. A Tyus follow basket capped a 2-14 Maccabi run. 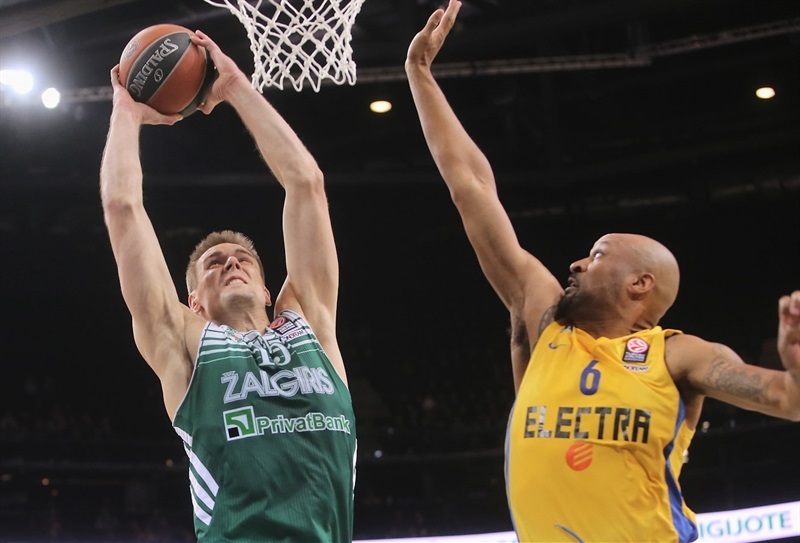 Zalgiris responded with back-to-back threes by Lavrinovic and Milaknis for a 63-60 lead. Smith sank a short jumper over Dentmon to tie the score at 63-63. Rice beat the 24-second clock with a lucky heave, but Dentmon matched him to make it 66-66. Rice passed back to Hickman for a fastbreak slam. A Dimsa triple gave Zalgiris back the lead and the arena erupted after Dentmon fed Dimsa for a slam on the break. Ohayon penetrated and finished strong to make it 71-70 midway through the quarter. Then Rice put Maccabi ahead with a tough basket-plus-foul. 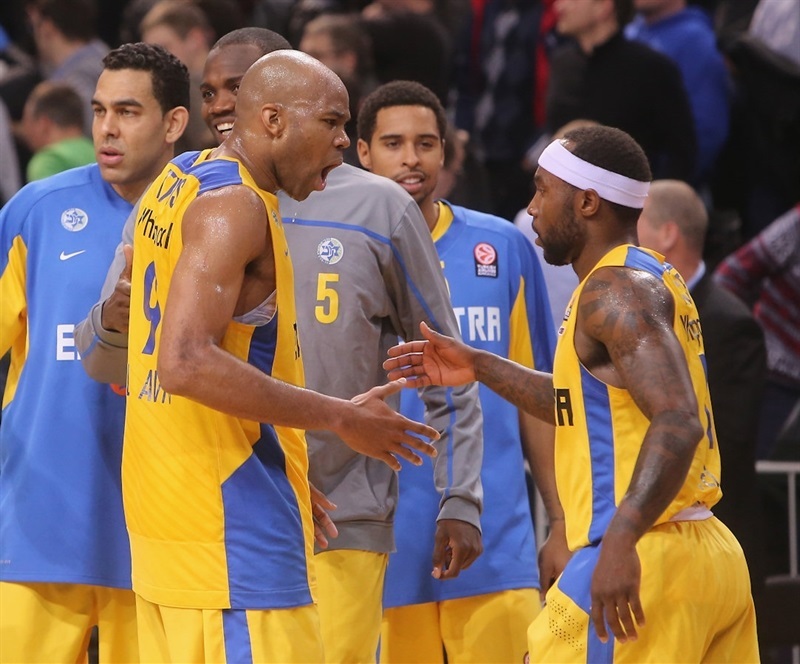 Ohayon kept the pressure on with a three-pointer as the Maccabi bench erupted. Lavrinovic drew his team within 3 with a pair of free throws. Smith banked in a shot while falling over to make it 73-78 with three minutes remaining. Smith continued his strong crunch time play with a triple. Dentmon kept the hosts alive with a clutch triple, but the guard lost the ball on the ensuing possession. Another unlucky Zalgiris turnover and 2 Rice free throws with 19 seconds remaining all but iced the victory. Rice had the final word with a triple as Maccabi raced home with the win. "We were playing against a strong and experienced team. Maccabi has a deep squad and an equal bench. They used it well. We missed Saras tonight due to back spasms. We lacked energy in the end because our younger guys aren’t used to playing such long stretches. But I’m happy with how our guys played. They gave everything on the court." "The Top 16 is tough and challenging and victories come only after a great effort from each and every player. Our team has already for some time shown dedication, will and desire, and these are things needed to win games at this level. It’s good that we have already won our second road game in the Top 16, but I repeat that this stage is very long and we have a lot of basketball and tough games in front of us. In order to achieve our next goal – advancing to the playoffs – we need to continue improving and giving everything. 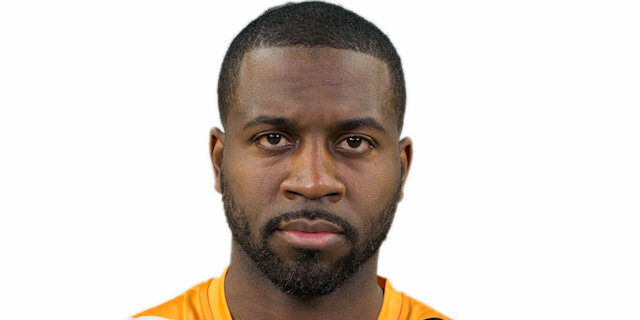 "We had better minutes and less good minutes in the game, but the second half – and in particular the fourth quarter – just like against Galatasaray and Kuban, was excellent. That shows that we have improved in certain parameters that we were less good in at the beginning of the season. "Yogi and Rice were wonderful, together and each one separately. They ran the team really well together, which is something we have tried out lately and it’s good we have that option. Ricky played hurt, just like Sofo last week, and that shows the incredible dedication the players have for this club. " "We are very upset. We just hate to lose like that. We just stopped playing our game and unfortunately slowed down the tempo. The game was really good in the first half. We created well and our opponents couldn’t stop us. 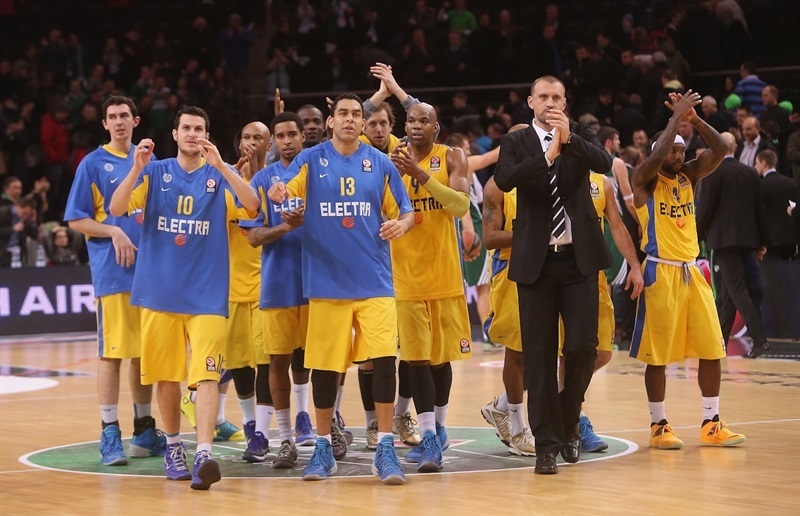 Maccabi was good in the clutch, while we missed some shots." " We fought hard and as usual, we didn’t give up. 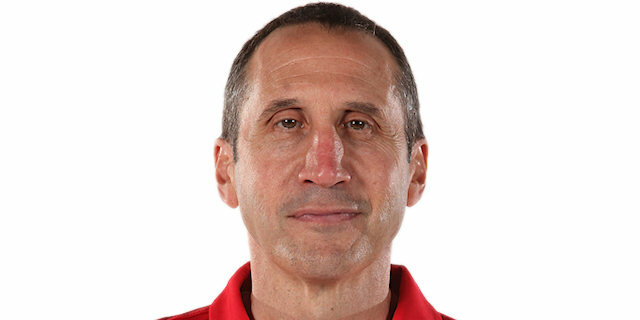 In the first half we had a hard time and allowed them to do whatever they wanted. But in the second half we showed what we’re worth and we held them to 32 points. We came here to win and we did it. I am so happy to win for the first time in this arena. It’s tough to win here. Yogi was wonderful. He had a great double-double. Coach has been playing us together lately and it’s been fun. "